In the last few weeks I’ve become increasingly obsessed with the evil genius that is Swoopo.com. 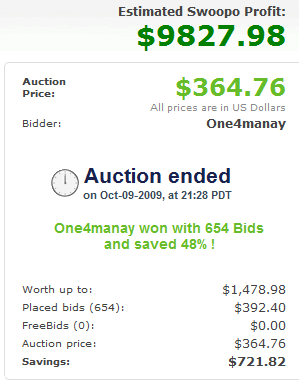 Swoopo is a penny-auction site - users buy bids for $0.60, and each bid placed on an item increases the price by $0.12. The cost of bids and the amount they increase the price of the item vary depending on the type of auction and the country you’re in. Swoopo does a lot to make it harder to win, though. For example, if the bid is placed within 10 seconds of the end of an auction, the closing time of the auction is extended by 10 seconds or so, so people can have last-second-sniping wars for as long as they want. They also offer a “BidButler” service that will automatically bid for you, and of course if two users in an auction are using it, the BidButlers just fight until they’ve used up all the money they were given. Swoopo’s operation is like cold fusion for money - they make insane amounts of cash off their users, and they only have to drop-ship the item to one user so there’s theoretically very little operating cost (they already have the money from selling bids, and they don’t need to maintain inventory). They’re shameless enough to even have auctions for cash, gold, and even more bids! Because everyone in the auction is paying to participate, even if the winner gets some savings on the item, Swoopo makes far, far more on the sunk bids - sometimes 10x the price of the item in pure profit. Jeff Atwood (of codinghorror.com) has written about Swoopo multiple times, and some techies have even tried to game the system, but it hasn’t worked. I was introduced to Swoopo through Jeff’s blog but I hadn’t thought about it forever, and for some reason it came up again recently. After looking at it a bit, I was just floored by how they’ve managed to set up such a perfect money-generating system. The company that runs Swoopo is called “Entertainment Shopping”, which I guess is supposed to be a suggestion that it’s like gambling (where it’s “fun” to lose money) though they really, really don’t want to be regulated as gambling. I don’t personally find gambling (or bidding on Swoopo) to be that fun, but I do find it entertaining to watch the astronomical profits tick up as more and more suckers toss money into an auction. So I built a little Greasemonkey script that’ll add the estimated profit to Swoopo above the price of an auction, updating in real time as people place bids. I’m calculating it with all the fairness to Swoopo I can muster. I calculate the number of bids based on the current price and the amount each bid moves the price (bidAmount) times the cost of bids (bidCost). The winner still has to pay the current price, so I add that in, but I subtract what Swoopo says the item is “worth up to” since they probably have to pay around that to drop-ship it to a customer. As the example screenshot shows, this leads to examples like an iMac selling for $364.75 (plus another $392.40 in bids for the winner), but a total pure profit of $9,827.98 for Swoopo. Exciting! I’ll readily admit that my calculation is not always 100% accurate. There are a number of things I don’t take into account - I assume shipping is a wash, so it’s not included. I assume Swoopo’s paying the full retail “worth up to” price when they’re probably not. I count bids as all costing the same even though they might have been won at a “discount” via a bid auction. In cases where I can’t figure out some numbers I default them to hardcoded values, which might be wrong. I also don’t take into account “Swoop it now”, which lets bidders buy the item for its full price minus the money they’ve sunk into bids, effectively getting out of the auction entirely. This would reduce Swoopo’s profits but it isn’t recorded anywhere so I can’t factor it in. So take the number with a grain of salt - it’s entertainment. Grab the script and start poking around swoopo.com. Hopefully you’ll have as much fun as I have with it. As a side note about my Greasemonkey scripts, I’ve retired the “Amazon Super Saver Snooper” script. Amazon has changed the way the API used to look up Super Saver eligability works, and I can’t get at that data anymore. 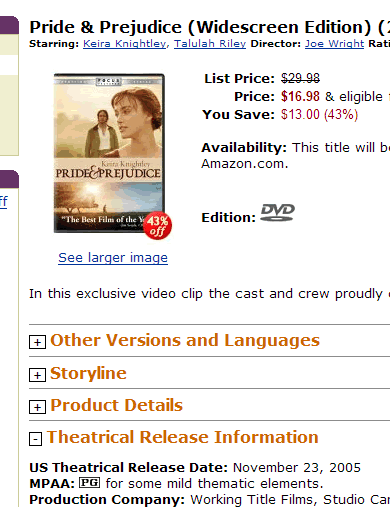 More importantly, Amazon now puts “Prime” logos next to Prime-shippable items, so the script isn’t necessary anymore. Some time ago I came across the RIAA Radar site, which uses Amazon’s E-Commerce Web Service to cross-reference the labels musical albums are published under with known RIAA members. The idea is that you can use the service to help restrict your music purchases to labels that do not affiliate themselves with the RIAA, and by extension the RIAA’s strongarm tactics against music fans. I liked the idea but didn’t want to have to visit the site every time I looked at an album. Fortunately the site had a Greasemonkey script called RIAA Radar that would automatically insert a little icon on the Amazon detail page indicating whether it was from an RIAA label or not. Unfortunately, the script was broken. I went ahead and fixed up the script, as well as optimizing it and expanding its functionality. Since the site’s maintainer never accepted the revised version, so I’ve been maintaining a fork ever since. Anyway, with the launch of Amazon’s new MP3 Downloads store, I figured I could get RIAA Radar working with that too. It turned out to be pretty easy, and I was able to fix a bad URL in the script while I was at it. So the script should serve music fans even better as they browse the DRM-free music available at Amazon. I’ve taken another crack at my Collapsible Amazon Greasemonkey script, and I think it’s pretty complete now. Once you’ve installed the script, you’ll be able to click on the orange title of any section of an Amazon product detail page to collapse it out of sight, and the script will remember your preference for other pages. So you can customize your product page however you like, and it’ll stay that way. This new version makes it possible to collapse any of the orange-titled sections in the page (in older versions, a couple of them weren’t collapsible), and collapsing a section will now get rid of everything in the section, not just the main part. It should be a much nicer experience overall, and result in cleaner, more relevant product pages for everyone. Last night I hammered out a quick Greasemonkey script (poetically called “No Xbox Live Arcade Demos”) to solve one of my pet peeves in the otherwise awesome Xbox.com website. The problem is that while you can check out the list of games you’ve played, and all your achievements in them, it will also include Xbox Live Arcade demos that you’ve played but not purchased. Since you haven’t purchased them, you can’t earn achievements or gamerscore, so it’s kind of useless to have them in the list. All my script does is go and look for games with “0 of 200” points - indicating an Arcade game you haven’t played (or a new one, which is a problem but unfortunately that seems to be the best way to find them). As a bonus, the script also removes these games from your “total games” count, and removes their score from your total possible gamerscore. The total gamerscore thing in particular annoyed me, since you’d have to buy every demo to realize that “potential”. The script also works on the “Compare Achievements” page, removing any Arcade games that neither you nor your friend have played from the list. I hope everybody enjoys this! Just a quick heads up that I’ve uploaded a new version of Collapsible Amazon. It’s a Greasemonkey script that lets you collapse any section of the standard Amazon detail page. This update makes it work on a lot more sections - the only one it can’t collapse that I’ve found is the Customer Discussions section. Basically, wherever you see an orange header, you can click it and its content will disappear - and the script will remember that you want that type of section collapsed everywhere. Honestly, I’m no fan of Jane Austen - I was just looking for a screenshot! If you like this script, you should check out some of my other Greasemonkey scripts. I just release my newest Greasemonkey script: Amazon Super Saver Snooper. If you’re cheap like me, you always go for the free Super Saver shipping at Amazon.com (free shipping on orders over $25). It gets even better when you’ve got Amazon Prime (I got a 3-month free trial). And if you’re like me, you hate having to sift through the search results to find the items that are eligible for Super Saver. Well, that task has been alleviated by the power of Firefox and Greasemonkey. Just install my little script, and all the search results that are eligible for Prime / Super Saver will light up. Another cool bit is that the script will update the prices shown in the search to the lowest price available from a Super Saver-eligible source. That way you don’t get suckered into looking at cheap items you’ll have to pay shipping on. The script turned out to be pretty easy to write - it just calls the Amazon E-Commerce Web Service. I’m hoping to do some more cool stuff with that service in the future. If you’re into customizing Amazon don’t forget about my Collapsible Amazon script, too. And feel free to check out the rest of my scripts while you’re at it.